Let ‘em know what you stand for! In a world gone so digitally wrong, some of us still know what’s right. Vinyl Lives! This cool new design tells everyone what team you’re on. Meant to look something like a jersey, the back of the T-shirt shows your uniform number — and how could it be anything but 33 1⁄3? Super soft, 100% preshrunk ringspun cotton; generously cut; double-needle stitching throughout; 1/2" seamless rib at neck; shoulder-to-shoulder tape; pigment dyed. Vinyl Lives! 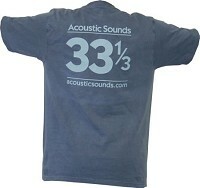 short sleeve T-shirts available in three colors. Choose from Desert Poppy, Mesquite or Santa Fe Blue in sizes M – XXL. 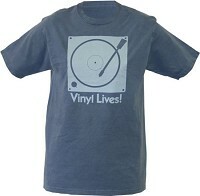 It's about time that someone produce a well-made T-Shirt that communicates the value of vinyl. Maybe some will think I am showing my age but when they see this shirt hopefully they will ask questions. So let us open a dialogue with the younger generation and spread the word that digital audio isn't everything!